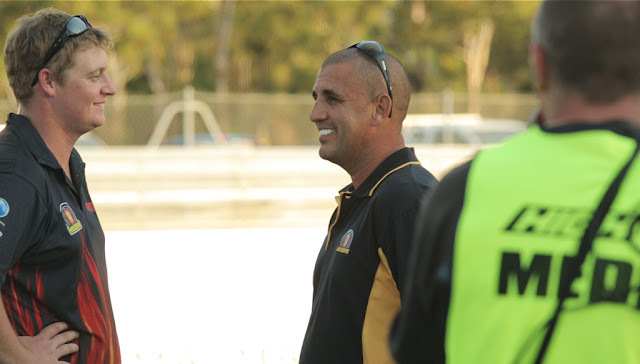 Hidden Valley Drag Racing Association's 2012 NT Quarter Mile Titles was touted by many (in fact everyone we spoke to over the weekend) as being the best most action packed event at the venue in years. An impressive lineup of cars broke records, set personal bests and provided the wild action that crowds at Hidden Valley have come to expect over recent years. Scott Maclean's AllTools Top Doorslammer set the mood for the entire weekend with his incredible 5.88 second pass at 243.33mph on Friday night which continued through to day two with Saturday's 7.642 for Scott White on his AMPAC Suzuki Pro Bike. Not to be outdone, South Australian Steve Norman (Outlaw bracket) set the record for the fastest naturally aspirated pass at the Hidden Valley Strip with a 7.186 at 194mph.